In these strange times the world is polarized into apparently irreconcilable opposing extremes. At the same time, the only possible way to bridge the divide and to begin a process of healing is for humanity to see itself as one. The following two articles by Benjamin Creme’s Master reveal and illustrate both the problems and the solution, and so point the way forward. Many are fearful and suffering; bereft of work and hope for the future, they struggle from day to day. But many others are making their future for themselves, and many, too, are dying in the process. Throughout the world men are awakening to the possibility of a better life with freedom and justice at its heart. Have no fear, the people’s voice is rising and like a contagion affecting more and more. Maitreya stands behind those who live – or die – for the truth of freedom, justice and the unity of man. The young lead the way, and the future is for them. The following unpublished questions and answers have been gathered from filmed lectures given by Benjamin Creme. The place and date prefacing each section indicate where and when the lecture took place. Q. Young people in Japan work day and night without sleeping to get money. Will we be able to see Maitreya? Living without consciousness, without a sense of the spiritual aspects of life? A. This is a symptom of the excess of commercialization. We have let it rule our lives, our destiny. Our destiny is to give expression to ourselves as gods – to demonstrate ourselves as gods. But in fact we are squabbling, competing, running to get more money than our neighbours. Why do it? Life is not about that. It is about relationship. What relationship can you have with people or the world if you are exhausted running after money? It is really a generation out of step with the needs of the times. Will they see Maitreya? Of course they will see Him, but will they recognize Him for Who He is? No one will not see Maitreya. Q. I hear that the people working for this group are volunteers? How do they make a living? I would like to volunteer but I need to earn a living. A. It is true they are all volunteers. They work, they make a living and do this work in their “free time”. It depends on the intensity of their aspiration and dedication how much time they give to work, to their family, going to the cinema and so on, and how much time they give this work of making known Maitreya and the Masters. Everyone is different. Some give almost all their time, others give less time, some don’t really put in a lot of time. No one is being asked to give up making a living. I have never asked anyone to give up their work, or looking after their family to do this work. Their volunteering comes from them, from their souls. It comes from the fact that they recognize themselves as souls and their soul is telling them “this is what you must do; this is the new time; this is the way to the new time”, and so they volunteer. It comes from the soul and the heart of the person. They see it is the most important thing they could do. If in your heart you feel “I must help because I cannot face the starving millions; I can’t think of people starving to death; I can’t think of great teachers being in the world and I did nothing to help”, when you feel like that then you have to volunteer. That’s the result of that feeling, as a soul, through your heart or your intuition, that you must take part. You are in incarnation today, it is your responsibility. Not everyone feels like this, the more’s the pity! But if you do feel you want to take part then you will. If you want to do the work you will find a way to do it. Think in terms of priorities. You have to prioritize. You have your work, you have to look after your family, but when you have free time, and perhaps you have more free time than you think, you can give time to the next priority which is being human today – seeing the problems of today and doing your best to change them. Q. What did you mean when you said that we have 15 years to restore the planet? A. There is a general misunderstanding among scientists and governments that we have 50 to 100 years to change our way of living, to not increase carbon emissions and to rectify... and restore balance. But, for example we have cut down so many thousands of acres of primal forest – the Amazon and other forests – forests which are essential for the production of oxygen. The trees are essential. We are destroying our own environment for purely commercial ends. The question of carbon emissions is complex. There are many people, some very influential people, who say that there is no problem at all – that the whole question is not to do with the actual structure of the planet and therefore that we do not have to do anything to counter carbon emissions. This is the most dangerous attitude of all – to deny the very existence of the problem. Again, it is for commercial ends. It costs money to cut out carbon emissions into the atmosphere. It means cutting out all the emissions from all coal-fired power stations and all nuclear power stations. There is a growing call in the world for more nuclear power stations – which are thought to be clean. In fact, they are the most dangerous source of power of all sources of energy that we could have. All nuclear power stations should be shut down immediately. Q. When Maitreya speaks of His Father, the One who sent Him, does He refer to the One who embodies the planet Earth or the One who embodies the sun, the solar system, or the One of the beginning of all times? A. He is talking about the One who is the reflection of our Planetary Logos, Sanat Kumara, the Lord of the World. Q. We were handing out lots of S.O.P. (Save Our Planet) stickers at our booths and finding that people really liked them. It occurred to us that we could couple them with the S.O.P. brochures from Share International New Zealand (that basically overviews Share International’s view of how to save the planet), so that people received Maitreya’s message about sharing at the same time. Because you have said that the S.O.P. message is too important to be linked with a particular organization, is the coupling of the S.O.P. sticker with the brochure an acceptable tack for getting Share International’s information out, or should the S.O.P. stickers be handed out strictly by themselves? A.It is acceptable to hand them out together. 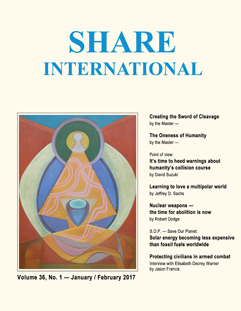 Share International has a very large reserve of ‘Letters to the Editor’, which were reviewed by Benjamin Creme but not published. We will now be able to print these letters, some of which were received years ago while others are quite recent. All experiences described in the letters were confirmed by BC’s Master to be genuine. If new and unconfirmed, we present them for your consideration. What a beautiful piece about Benjamin Creme (SI, Dec 2016). I was touched and moved, because it expressed so much love and respect. It was really very special and consoling. The whole magazine to me is pervaded with so much good and gave hope, that I would like to thank you for it. It is wonderful that you can still draw on so much material. With many warm greetings and many thanks for your work. (1) I recently read an article about Benjamin Creme’s life and his recent passing. The writer wondered how ‘Creme’s supporters’ would carry on without him and without guidance or help. I offer here my own experience which happened about a month after Mr Creme’s passing. I was wondering whether, with the turmoil in the world at present, the attention of Benjamin Creme’s Master would be urgently required elsewhere and that we, in the groups who worked with Benjamin Creme, would have to get used to working without His inspiring presence through Mr Creme. Immediately I sat down to meditate such energy, more powerful than ever before, poured down into and over me, leaving me in no doubt of the closeness of the Masters. My thoughts had been heard, my query answered and conviction re-confirmed. (2) One evening, a month or so after Benjamin Creme died, at the end of my personal meditation I asked Maitreya, using Maitreya’s ‘hand’ card, for specific help to do with the heart chakra. The response was instantaneous. This process appears to be continuing as the days go by and we enter 2017. We are not alone. All thoughts and prayers are heard and answered. On Mondays we have Transmission Meditation in our home in Almelo, the Netherlands. I was at home on 18 February  by myself and realizing I didn’t have much time before the Transmission I hurried to the shopping centre in our neighbourhood to buy some food. Approaching the most frequented entrance of that shopping centre I saw a man standing there with a copy of the Turin Shroud showing Jesus’ face, in full colour. The copy, which was about 30 x 60cm, was hanging around his neck in a simple wooden frame. In his hand he had small leaflets with the same copy of Jesus’ face, too, in full colour. On the back some text was printed. When I saw all this I got a shock as I thought this man might be Maitreya or Jesus. But then I started to hesitate and to look more closely and then you become confused and make mistakes. I thought: It can’t be Maitreya or Jesus. He was a tall man, about 1.90m, very poorly dressed, as if he came directly from the farm where he worked, but dressed in the fashion of the 1960s. He had a very thin and poor face with little burst blood vessels, giving him very red cheeks in the cold and rainy weather. I did my shopping and left through the same door as I entered. He was still standing there. I thought of addressing him and asking which organization he was representing there. But I didn’t feel compelled to go to him, since he did not look very inviting, as he always had his face turned away from me and from other people who passed him. I decided to walk back home. Back home I kept on thinking of this meeting. A few days later I realized that it seemed as if the people who were there with me at the entrance had not seen him, because no one looked at him, although he was a remarkable (tall) figure standing there with that big photo copy over his stomach. I had a very concentrated Transmission Meditation that evening, one I had never had before. You always look for an explanation when you think you’ve met a Master. Personally I think that these meetings are encouraging you to go on with your life, to go on with the work you are doing, just a pat on the back. I felt touched and extremely grateful for this attention. Am I right about this experience: was it a meeting with Maitreya or Jesus? Was there a message which I did not see? In any case, it gave me a very good feeling. Name withheld, Almelo, the Netherlands. (1) While I was in Schermerhorn, the Netherlands, for a short while earlier this year  I was out walking the dog on a road next to a river when, suddenly, at a distance of about 25 meters I saw a tall man and a much shorter woman walking hand in hand towards me. The man was dressed in white, wore glasses and a little hat. The woman looked Asian and wore her hair pulled back in a chignon or bun. When they reached me, the man greeted me and said: “It’s very quiet here, isn’t it?” I agreed and he added, “We’re staying just a bit further along in a caravan,” and he pointed towards the canal (behind me) some distance away. His face was radiant and smiling and his eyes dark and clear. The woman just stood there smiling serenely, looking at me in silence. All the while I had no sense of my surroundings – such a silence prevailed around us. Then the man said: “We’re going to walk further now.” They said goodbye and walked on. I looked around to see if they might have disappeared, but I saw their silhouettes in the distance. (2) A day later I was walking the dog again when I looked around and saw a man and a little child. The father bent over and pushed his son who was on a little tricycle. A few seconds later I looked around again but could see no one. So I walked back to see if they had possibly left the path to their house but, again, no one in sight! The distance from the road over a rough path to the house on the canal was about 25 to 30 meters. They had simply disappeared. Could it be that the father ran home quickly with his son or is this quite “a different kettle of fish”? (1) My friend Angela and I met in San Francisco to attend Benjamin Creme’s lecture on 6 August 2002. We arrived early and anxiously waited for the auditorium to open so that we could find a good seat in front. We sat on a narrow row with just three seats. As we sat down I laughingly said to my friend: “I’m saving this seat next to me for someone special.” I then wondered why I had said that. We were happily talking about hearing this special lecture again, as it had been over 10 years since I had been able to attend one of Mr Creme’s lectures. Soon a tall, very well-dressed man with white hair very politely asked: “May I sit next to you in this seat?” His distinguished presence surprised me. My initial impression was that perhaps he was a diplomat or a television personality. He was impeccably dressed and his shoes looked as though they had never been worn. I asked if this was the first time he had attended one of Mr Creme’s lectures. While I don’t remember his exact reply, he said that he had seen a poster at an art show about Siddhartha and that this lecture must be important to be held in such a large hall. He said that he lived “just across over there” pointing towards the Christ Church Cathedral. Mentally, I was trying to place an apartment building or something in that direction. Then I said to him: “I think you are in for a real treat.” He started asking me questions about when I first knew about this story. Since he was so easy to talk with and made me so comfortable, I started telling him about my first hearing of Maitreya. I told him that in 1977 the teacher of an Alice Bailey study group received a letter from London telling of Benjamin Creme’s meetings as well as the first telepathic message received from Maitreya. When I heard the first Maitreya message I was electrified. I told the distinguished gentleman that it just did something to me and rang true. He nodded. I said my initial reaction was to fly to London to hear this man speak, but I thought that was not the thing I should do. Perhaps this man was just a nice, very polite, distinguished gentleman. He looked so familiar, but I can’t place him. Maybe I have seen him on TV, or could he possibly be the Master Jesus? [Postscript] For a couple of years I have been having trouble walking, due to the pain caused from disc problems in my lower back and hips. It was just laughable when Angela and I were walking up those hills in San Francisco to get to the lecture. We stopped every couple of minutes… laughing all the way. After the lecture, when I left the stage from seeing you, I realized that I was not limping. I was already better! Thank you for all your help and guidance you have given for so many years. I realize how blessed we all have been and will do my part better to get this Message of Hope to others. I know these past 20 or so years of my life have been the most important and I need to do more…. (2) In the late summer of 1996 when I lived in Portland, Oregon, I was sitting on the sidewalk on the side of a hill next to my house tending a flowerbed. After a wet summer and then higher temperatures, the blooms had faded and some of the plants had powdery mildew and were in need of help. I was trying to cut off dead blooms and pull up some of the plants when two young blond, blue-eyed boys who looked to be around six years old stopped right next to me and asked: “Are you happy?” “Do you enjoy what you are doing?” I was quite surprised to hear such a question from these young boys whom I had never seen. I don’t remember how I actually answered them, but I do remember smiling at them and wondering where they lived. They said “goodbye” and walked on past me up the hill. A few seconds later I looked back to see them and they were gone… perhaps around the corner. I was still a little stunned by their question and wondered if I would ever see them again. I never did. Many years have passed since this pleasant encounter, but I will never forget the sincere, caring look they gave me. Could they possibly have been the Master Jesus and Maitreya? A long time ago, about November 1982, I happened to meet a person whose appearance remained a miracle for me up to the recent past. In 1982 when the labour market was really tight I was looking for a job in Vienna. An interview was scheduled that day for 9am. Based upon my performance along with that interview, a final decision was expected from management. It was paramount for me to get that job. To be right on time I was waiting in my car very close to the company and spent the remaining moments in ardent prayer. Suddenly someone was knocking on the window. As I looked towards that person, I saw a very old woman, reminding me in her habits very much of my late grandmother. She gave me a sign to open the window. As I opened my hand it turned out that she gave me a medallion with Mary and her boychild Jesus. Moments later, when I looked up again to return my thanks, the person was ‘vanished into the air’. Although I immediately left my car in order to pursue her, I did not succeed. In the course of the upcoming interview, which lasted for hours, I had to go through intensive and tough exams. Nevertheless, with yet unknown energy I mastered all the hurdles and finally got a job offer. Now some years later I would be interested to know who that very old and gracious woman really was? (1) In 1998 I was visiting my parents and brought home a videotape of an interview with you [Benjamin Creme], talking about the reappearance which I played for my mother. When the tape had ended, I asked my mother what she thought. She hesitated and then said it was fine, that the “special effects” were well done. I was surprised at her last remark as there are no “special effects” on the tape and said so to my mother. She replied: “The way Benjamin Creme disappeared and some other guy appeared where Ben had been.” “I didn’t see that,” said I. My mother told me to quit fooling around. I said that I was not, and that she had seen something that was not on the tape. She put the tape away and said she would watch it again sometime later. To this day I’m not sure if she has. Could you please ask your Master if Maitreya had anything to do with this? (2) In the summer of 1994, I had driven down to San Francisco with the intention of hearing Mr Creme’s lecture. The day of his lecture, in fact, just an hour or so before, my travelling companion – who also wanted to hear him speak, turned to me (I am driving the car on the freeway) and says: “Let’s go sit and chill out by the sea and look at the Red Woods.” I thought about his suggestion, thinking that our trip down from Vancouver, Canada, was for Mr Creme’s talk. I asked myself what did I want to do. Suddenly the freeway, steering wheel, car, sky, everything, turned black, as though the lights had been turned out on the world and all I could see was Benjamin Creme’s face and silver hair. Just like that it was gone and the lights had come up again. I was still driving down the freeway heading into San Francisco. I then said to my friend: “I don’t know about you, but I am going to hear Benjamin Creme’s talk.” He looked at me and said: “Alright.” Could your Master explain what happened? Who or what was responsible for this experience? Throughout January 2017, NASA’s Solar and Heliospheric Observatory (SOHO) photographed large objects near the sun that appeared to be emitting energy beams. Benjamin Creme at the Meervaart Theatre in Amsterdam, on 27 September 2007. Photographed and sent by N.Z., Zwijndrecht, the Netherlands. During the October 2016 protests at Standing Rock in North Dakota against the proposed Dakota Access Pipeline, a herd of wild buffalo galloped down the hill to the delight of the protestors. The protest has seen a converging of tribes of indigenous peoples plus environmental activists from across North America to prevent the pipeline (which they see as the “black snake” of ancient prophecy) being built on their sacred land and through Lake Oahe, the primary source of drinking water for the Standing Rock Sioux nation. Traditionally, Native Indians honour the buffalo as a gift from the Great Spirit, and believe that as long as they roam free and the herds are bountiful, the sovereignty of indigenous people would remain strong. The bison’s sudden appearance “out of nowhere” was taken as a sign of support by the protestors, as they had been praying for assistance from the “Buffalo Nation” during their standoff with riot police and national guardsmen. We present a selection of quotations on the theme of “Keep your eyes on the prize!”. The quotations are taken from Maitreya (Messages from Maitreya the Christ and Maitreya’s Teachings – The Laws of Life), Benjamin Creme’s Master (A Master Speaks and Share International), and Benjamin Creme’s writings. “Waking up! Waking up! The world belongs to the human race, brother…. I am proud today to hear my brothers and sisters speaking the truth and showing out the lies, the lies, that’s beautiful! All the young generation, black, white, they are all going around this place, and I love to see that, and I would never miss it for a million pounds, brothers! And all my little brothers there, all my little brothers and sisters, all the way, coming from way out! I am glad, I am really glad! We are waking up! … Wake up, brother, keep the faith! Maitreya is the embodiment of the energy which we call Love, the Christ Principle, and He pours that Love into the world all the time, daily, in an unending flow. This has a subtle but very definite effect on the way people think and act. It works in two ways. In the Bible it is called the “Sword of Cleavage”. He comes as the Sword of Cleavage, not to unite people but to “set brother against brother and father against son”. This is a symbolic way of talking about that energy of Love which is completely impersonal. It stimulates everything, the good and the bad, the selfish and the altruistic, all at the same time. So it takes enormous knowledge and skill-in-action by Maitreya to make sure that more people absorb it who can use it altruistically than do those who would use it selfishly. It is a juggling act. It stimulates everybody, so that the selfish become more selfish, and the altruistic become more and more altruistic. In this way the choice which humanity has to make becomes very clear…. The task of Hierarchy is to implement the Plan of God through “The Centre which we call the Race of Men”. This must be done while respecting, at all times, man’s divine free will. Thus, look not for perfection in the working out of the Plan from day to day or year to year. The long-term aim is assured, of that there is no doubt. Man alone dictates the vagaries of the path by which it proceeds. Soon you will see a lessening of the tensions which today grip the world. Events are nearing a crisis which will resolve these disparate forces and allow saner viewpoints to be heard. Today, once again, the moment has come for the people’s voice to be heard. Today, once more, it is essential that the needs of people everywhere for justice, freedom and peace are heard and recognized by the wielders of reckless power. These dangerous men, caught up in the glamour of their power, must realize that the time for war is past, that humanity longs for peace and a security quickly vanishing. The little ‘Napoleons’ must be told that their days of power are over; that the times have robbed them of all relevance; and that the power now lies with those who serve the true needs of the people. My friends, My brothers and sisters, take stock of where you now stand. Are you ready to go with Me to the Blessed Isle of Love? Are you ready to share with all that which you now have? The world is divided into two groups of people, one progressive and the other conservative and reactionary. The conservative and reactionary forces are those who love the past, who are holding on to the old Piscean order (whose very nature is based on separation and cleavage). That is what we are witnessing today. The progressive forces are those who are looking for a more constructive and more inclusive way of living, in which the Aquarian forces, the forces of synthesis, fusion and blending can find expression. At this decisive moment for humanity and the planet – with the potential for a leap of consciousness into wondrous new beginnings or the stark possibility of cataclysmic disaster should we not change course – faith, hope and constructive action are especially crucial for humanity’s well-being. Yet at this time, many confront the challenge of finding the inner peace and equilibrium to sustain that faith and hope. In response to this universal quandary, two of the world’s pre-eminent and best-loved spiritual leaders, His Holiness the Dalai Lama and Archbishop Desmond Tutu, have made use of a birthday celebration to address the most daunting spiritual problems besetting humanity. A little background is needed: in 2011, Archbishop Tutu sought to invite his good friend the Dalai Lama to the celebration commemorating his 80th birthday. The government of South Africa, bowing to political pressure from the Chinese government, and over the strong objection of the Archbishop, denied the Dalai Lama permission to enter the country. So, in 2015, for the Dalai Lama’s 80th birthday, arrangements were made for the Archbishop to attend the week-long celebrations at His Holiness’ residence-in-exile in Dharamsala, India. They were joined there by Douglas Abrams, author and assistant to the Archbishop, and Thupten Jinpa, a Buddhist scholar, and the Dalai Lama’s principal translator for over 30 years. Although a rare opportunity for two old friends to spend some time in each other’s company, the week-long dialogue avowedly had a greater purpose: to address the question of how to develop and sustain lasting joy in a troubled, often harrowing world. The sense of authenticity that these two bring to such issues comes, as many may know, from both having been severely tested in the fires of calamitous world events. Having become the leader of six million Tibetans at the age of 15, and then attempting for nine years to negotiate with the Chinese leadership occupying his country, the Dalai Lama left Tibet in 1959 at the age of 24 to prevent an uprising that would have resulted in a brutal massacre of his people. He was later asked by President Nelson Mandela to create the Truth and Reconciliation Commission in an effort to confront the horrors of apartheid and guide the country into a future free of revenge and retribution. Each of these men has surmounted enormous challenges, both personally and by having made the burdens of entire nations their own. And yet they have not lost touch with the wellspring of their inner joy, nor have they lost touch with their essential humanity. “The Archbishop has never claimed sainthood and the Dalai Lama considers himself a simple monk.” (p.7) Much of what they are able to share with us is reflected in this statement. At no point does either man say that painful situations and negative states of mind can be avoided. Over and again, it is stressed that these conditions are a part of life, and that it is how we view them and respond to them that we determine what our lives will be. Both see trials and difficulties as opportunities for growth and spiritual development. The question then becomes one of perspective. The idea is to expand one’s personal point of view outward until it begins to take in the struggles of all humanity. As we do, we may seek to do something to alleviate not only our own suffering, but that of others. Both leaders, however, address the psychological conditioning that makes that expansion problematic for some. One of the qualities that makes this book a delight to read is the profound and palpable brotherly love these two men have for each other. In between their more serious reflections can be seen numerous moments of gently playful teasing and banter in which they joyfully engage, and the pleasure they take in each other’s company. The symbolic significance, however, of the meeting of these two cannot be overstated. Because of the status each holds in the world, and because of the spiritual traditions they embody, this book is, as much as anything, a representation of unity between East and West, and an exhortation by example to relinquish our more parochial attachments to one spiritual tradition or another and to see the entire human family as one. That oneness is at the heart of all their contemplations, and there is no doubt that the two, each in his own way and within his own spiritual tradition, echo the precepts of the Ageless Wisdom Teachings as set forth by Maitreya and the Masters of Wisdom – that of our essential unity regardless of race, nationality or spiritual inclination, and that our concerns need to embrace not only those in our immediate surroundings, but those of humanity as a whole. As exemplars of these principles made manifest, the Archbishop and the Dalai Lama have served the world exceedingly well. The Book of Joy: Lasting Happiness in a Changing World, by His Holiness the Dalai Lama and Archbishop Desmond Tutu, with Douglas Abrams. 2016, Avery Publications, 354 pages. Consensus is growing globally that competition-based education is increasingly counter-productive in preparing students for meaningful lives. Studies show that steady improvements in student learning have been attained through the Finnish education policies which are based on equity, flexibility, creativity, teacher professionalism and trust. The Finnish school system is practically free of any financial competition. In fact, Finland is an example of a nation that has developed from a remote agrarian/industrial state in the 1950s to a model knowledge economy, using education as the key to economic and social development. The road to compulsory education in Finland started in 1921 with the Compulsory Education Act, which, in contradiction to many other countries, declared the acquiring of skills as compulsory, not the attending of school per se. Beginning in the 1940s, and reaching full force in the 1970s, parallel schools were abolished in favour of a comprehensive school system. For the first time, with this change, basic education in Finland became totally free of any cost. As of 1978 all pupils received also a free daily lunch as part of the new system. Whereas the old parallel school system was too costly for some, for all, it meant a split of students at the age of 11 into streams leading to either vocational training professions or gymnasium/university based professions. Studies show that a result of comprehensive school reform was that parental income was no longer a strong indicator of the likely future income of the children; as a consequence equality of opportunity grew. Numerous PISA* tests have shown that the Finnish children receive a good education as part of the non-competitive system. In reading, Finland was first in 2000, in mathematics, first in 2003 and first in science in 2006. Very few Finnish pupils are among the lower achievers whereas a lot of pupils achieve high marks. In the 2009 study a whopping 19 per cent were among the top science achievers, second only to Shanghai (24 per cent) and Singapore (20 per cent). Finland also ranks at the top of Transparency International’s list of least corrupt nations. This, says Pasi Sahlberg, an internationally recognized speaker on the Finnish educational system, plays a crucial role in maintaining a well-functioning democracy, trust-based public sector management and basic functions of the welfare state. All this in turn helps keep the common good as a common goal and allows for universal free education to remain a given in Finland. He also maintains that political empowerment of women is a critical factor of a functioning educational system. In this respect Finland is second only to Iceland with the other Nordic countries following. “The most successful education systems are those that combine quality with equity,” says Pasi Sahlberg. * Programme for International Student Assessment (PISA) is a worldwide study by the Organisation for Economic Cooperation and Development (OECD) in member and non-member nations. Data is collected on 15-year-old school pupils’ scholastic performance on mathematics, science, and reading. It was first performed in 2000 and then repeated every three years. It is done with a view to improving education policies and outcomes. It measures problem solving and cognition in daily life. CIMO (Centre for International Mobility) together with the Finnish Ministry of Education and the Culture and National Board of Education have prepared a quick guide to the Finnish education system. Central to early years’ education in Finland is a “late” start to schooling. In all Finnish daycare centres, the emphasis is not on maths, reading or writing (children receive no formal instruction in these until they are seven and in primary school) but creative play. The prevailing attitude is that children under seven are not ready to start school and that they need time to play and be physically active, as well as creative. Finland devolves more power to teachers and pupils to design and direct learning. Teachers are well-paid, well-trained (they must complete a five-year specialist degree), respected by parents and valued and trusted by politicians. There is no inspection of schools and teachers, but a system of self-assessment. Educational policy and teaching is heavily research-based. Mark Lichty is the executive producer of a documentary on hydraulic fracturing (fracking) called Groundswell Rising. The film captures the passion of people engaged in a David verses Goliath confrontation in the United States and infuses human rights, public health and social justice into a deeply engaging film, which empowers viewers to make a difference in their communities. Through candid interviews and true stories, Groundswell Rising brings viewers into the lives of people directly impacted by fracking and those on the front lines dedicated to stopping this form of gas extraction. Mark was interviewed for Share International by Victoria Gater, while on his UK film tour. Share International: How did you become involved with the Groundswell Rising film? Mark Lichty: I was originally pro-fracking. I had a manufacturing plant and heard that there was cheap gas in Pennsylvania so I decided to convert to gas. I heated with oil so I converted from one fossil fuel to the other fossil fuel and it was only when my friend Renard Cohen said that he wanted to make a film on this issue that I became involved in the project. Then I started to do the research and realized I had made a mistake about converting to gas and that’s when I learnt about all the water and air contamination problems, their contribution to the climate crisis and all of the bad things that go along with the fracking business. I had spent over $200,000, really $300,000 in today’s money, on converting from oil to gas and the problem is now I don’t have that $300,000 to spend on alternative energy, so I am really a ‘microcosm’ for what’s happening on the planet: we’re spending money on a fossilized future when we should be spending money on a renewable future. And when we spend millions of dollars on pipelines and infrastructure, on compressor stations and so on, we no longer have that money to spend on a renewable future and it’s gone. And we’re just digging ourselves into a deeper fossilized future. SI: What is the situation with fracking in Pennsylvania where you live? ML: It’s still going strong. There are many of us – in the faith community, the health community – physicians and nurses, who are very concerned about fracking. Many of us are seeking a ban, a moratorium, but I call it a ‘moraltorium’, to stop fracking. I am convinced that it can’t be done safely; it is very difficult because of the pervasiveness of the money in the gas business and how much the gas industry owns the government. It’s almost impossible to get the government to stop fracking. We have had some success in the court system. The Pennsylvania Supreme Court said that fracking is “detrimental to health and the environment”, so we’re finding the best way to play this game is in the court system, as they are less contaminated with money. SI: You have shown your film to many audiences. What sort of an impact do you witness it having on them? SI: You finished making the film three years ago. If you were to remake the film again today would you do anything differently? ML: Absolutely. One of the things that we didn’t understand at all at the time was the degree of fracking’s contribution to the climate crisis. Fracking, because of the excessive escape of methane, is worse than coal. Methane is 84 times more harmful than carbon dioxide. The way fracking is done now is more harmful than burning coal and what we see in Pennsylvania is that many coal-fired plants are scheduled to be converted to gas-fired plants. We would be better off not spending those millions and millions of dollars converting those to gas plants. We should spend that money on renewable energy instead, but we haven’t figured that out yet, unfortunately. I would have included more on methane, and also more on earthquakes. Some clips can be seen on our website which are not in the movie. ML: I think now is the time to act. We have been talking of strategy in England during this tour and it seems to be evolving towards a strategy of getting local Frack Free Zones which is comparable to what was successful in Florida, and comparable to Australia’s ‘Lock the Gate’ strategy. The effort to give people a voice at the local level, I think, is a very good strategy. We also need to think about what we can do individually to conserve energy. If you act individually we don’t know what ripples we will create. I will add a personal story here. I was diagnosed with prostate cancer 11 years ago. My father tragically had prostate cancer and his situation inspired me [to change]. I went on a vegetarian diet and did various things to deal with the prostate cancer, and am healthier now than I have ever been. The end result of that is, in terms of my eating habits, that I have one-sixteenth the carbon footprint that I had when I was a meat-eater, and that’s a pretty significant reduction in my carbon footprint. So there are things we can do and major statements that we can make as individuals. We can make decisions to protect our planet right now today and see the effects of those things. As the pressure of change takes place, inevitably there is a reaction, a counterthrust, and so there is a swing to the right. "...the lives of the richest people in the most prosperous parts of the world are agonisingly visible to anyone, however poor, who has access to a phone." There is no doubt that both the British and American votes were an expression of anger and frustration by people who felt they had been forgotten by society and abandoned by their leaders. “It was, everyone seems to agree, the moment when the forgotten spoke, finding their voices to reject the advice and guidance of experts and the elite everywhere,” says Hawking. He described an unequal, unfair world, in which technological progress, automation and a globalized market only served to expand unemployment into the middle-classes. Improved social media exposed a greater gap than ever between rich and poor. How else should the marginalized make their voices heard? “We need to put this alongside the financial crash, which brought home to people that a very few individuals working in the financial sector can accrue huge rewards and that the rest of us underwrite that success and pick up the bill when their greed leads us astray. So taken together we are living in a world of widening, not diminishing, financial inequality, in which many people can see not just their standard of living, but their ability to earn a living at all, disappearing. It is no wonder then that they are searching for a new deal, which Trump and Brexit might have appeared to represent. “....the lives of the richest people in the most prosperous parts of the world are agonisingly visible to anyone, however poor, who has access to a phone. And since there are now more people with a telephone than access to clean water in sub-Saharan Africa, this will shortly mean nearly everyone on our increasingly crowded planet will not be able to escape the inequality. The idea that we are at the end of an age and the beginning of a new one seems to be taking hold in the mainstream – albeit within a much shorter timespan than Share International readers are used to! For example, in a New Year statement, Brian Eno, UK musician (pioneer of ‘ambient’ music) and activist, questions the prevalent pessimistic view that “2016 was a terrible year, and the beginning of a long decline”. Instead he believes it might mark “the end – not the beginning – of a long decline” of the last 40 years of “unrestrained individualism”, that championed “a sort of righteous selfishness”, leading to the gross inequalities and crushing of hopes for the future that we see today. Eno argues that alongside the obvious oppositional populist anger of 2016 there has been a quieter but equally powerful movement: “people are re-thinking what democracy means, what society means” and “most importantly thinking out loud, thinking together”. Gar Alperovitz has had a distinguished career as a historian, political economist, activist, writer, and government official. Some of his notable works are: Unjust Deserts: How the Rich Are Taking Our Common Inheritance (2008), Making a Place for Community: Local Democracy in a Global Era, (2003). The key to the argument says Alperovitz is “the simple reality that most of what we all receive as ‘income’ far, far exceeds what anyone can claim as the result of the ‘work’ they actually do in the here and now. Once this fully documented reality is understood, the moral case for a basic income for all becomes very different from conventional understandings. The starting point is recognition that most ‘income’ is, in fact, a gift of the past”. His main thesis is that all income is inherited and stems from the past. He refers to it as the central moral point: “A person born at the end of the current century will have done absolutely nothing to enable or deserve this enormous gain. All of it will come to that person as a gift from the past, mainly from the accumulation of technological and scientific knowledge she receives just by being born.” (author’s italics). If we accept the argument that “some portion of income comes from the past – from this ‘huge overhang of technological inheritance’ as the late Stanford University economic Historian Nathan Rosenberg termed it – then a basic share should be due to each of us simply because we are members of the ongoing human community. And clearly, if the overwhelming source of modern wealth is a collective and common inheritance of knowledge the incredibly inequitable distribution of that wealth in modern society is even more abhorrent and illogical”. Gar Alperovitz continues: “A reasonable case could be made to affirm some moral obligation to contribute something back to society in exchange for the gift from the past. On the other hand, a generous society might just as well say that as a matter of principle no one should go hungry or live a life of fear and insecurity, no matter what. If so, a modest part of the gift of the past would simply be allocated in support of a basic income as a simple matter of community. “Such generosity is likely, human nature being what it is, to come back to the community somehow and in some way, and penny pinching requirements are likely to reduce rather than increase the kind of culture a good society would hope to nurture. In this context, a basic income could also be seen as a dividend for the unpaid care work – the bulk of which falls on women and the poor – that is currently not valued in our economic system.